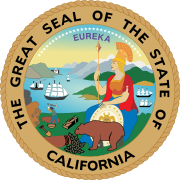 The 2010 California State Controller election was held on November 2, 2010, to choose the State Controller of California. The primary election was held on June 8, 2010. Incumbent John Chiang won reelection. The following were certified by the California Secretary of State as candidates in the primary election for State Controller. Candidates who won their respective primaries and qualified for the general election are shown in bold. ^ "2010 Gubernatorial Primary - June 8, 2010: Official Certified List of Candidates" (PDF). California Secretary of State. April 9, 2010. Archived from the original (PDF) on 2010-06-11. Retrieved June 2, 2010. ^ "Certified List of Write-In Candidates for the June 8, 2010, Statewide Direct Primary Election" (PDF). California Secretary of State. May 28, 2010. Archived from the original (PDF) on 2010-06-03. Retrieved June 2, 2010. This page was last edited on 13 December 2018, at 10:44 (UTC).